In the UNESCO world heritage city of George Town, on the Malaysian island of Penang, is a hotel that takes both art and environmentalism very seriously. Hotel Penaga was designed by its art­-loving owners, architect Hijjas Kasturi and his environmentalist wife Angela, to emphasis art, architecture, and environmentalism. 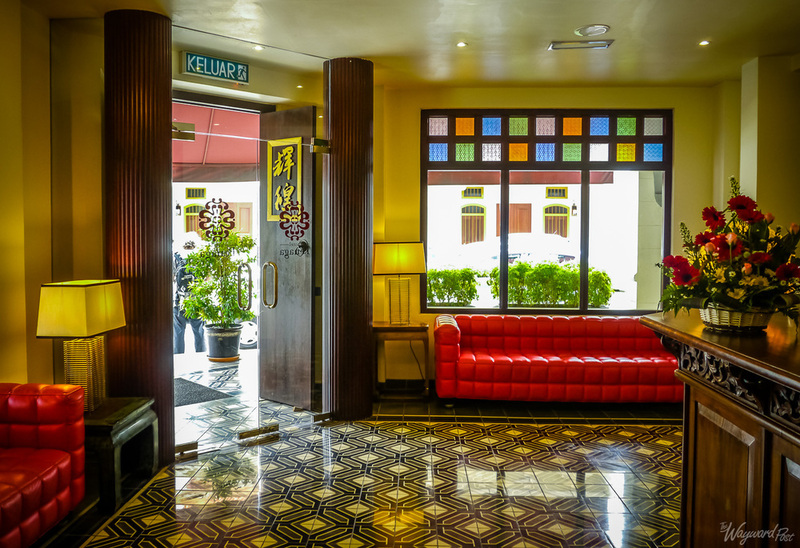 The structures which now make up the hotel were originally 15 pre-­war terrace buildings and shophouses. Like many of George Town’s buildings, they had fallen on hard times and had been abandoned to the weather. The hotel is on the edge of George Town’s UNESCO zone, so not subject to as strict restoration rules as some other buildings. Still, instead of ripping down the shophouses and starting afresh, the owners restored and renovated them reflecting their interests in architecture and environmentalism. The hotel has received many environmental awards, including a gold Green Building Index rating, a first for a heritage building in Malaysia. This award considers not just the environmental footprint, but social factors such as worker living conditions and on­site safety. The hotel was built favouring traditional labour intensive methods rather than being material intensive, and emphasized creating jobs for locals as well as for Bangladeshi and Indonesian workers. Recycled materials were used wherever possible, including roof tiles salvaged from demolished Penang buildings and colonial period timber from the Malaysian peninsula. New materials are generally handmade from the region, such as the patterned main floor tiles, which were made in Indonesia using presses and techniques from the 1930s. Because environmentalism was such a concern when the hotel was being designed, it is integrated into almost every aspect of the hotel. For example, water is heated via Solarmate MMS60 solar panels and a heat exchange system. Hotel Penaga has 99 solar photovoltaic panels that can generate up to 20.79 kWp — so much that the hotel can sell it back to the national power grid. Tucked in next to the building is an outdoor saltwater lap pool surrounded by a native plant garden. The garden was designed to increase soil permeability and reduce heat and glare from the hot Malaysian sun. It features mostly indigenous Malaysian species, and is watered from roof runoff. The granite slabs that function as garden features are actually ballast from Chinese ships coming to old Malaya to trade. Inside the hotel is a style that blends Frank Lloyd Wright Art Deco with a Chinese aesthetic. Many of the Chinese embroideries are from a Penang collector, David Allen, who rescued textiles from Malaysia’s notorious humidity. Art is everywhere. It includes works found by the owners on their travels, as well as pieces created by the artists from their artists-­in-­residence program. Artists from around the world are invited to apply for the residency and to stay at the hotel with a living allowance (artists from developing countries may also apply for airfare). Over 100 writers, choreographers, dancers, painters and sculptors have lived and worked at Hotel Penaga and added their works to the permanent collection. George Town’s artistic community and aesthetic, particularly the street art for which it is famous,­­ inspires both guests and resident artists. The two are given the opportunity to socialize together at the hotel. Hotel Penaga has 45 uniquely furnished and decorated rooms with sumptuous bedding and a luxurious bathroom with a spa bath. While staying there, you’ll find lots of insider information for getting to know George Town, its fantastic street art, local craft shopping, historical sites, and local food in both upscale restaurants and George Town’s famous hawker stalls. Editor's note: The writer was hosted by the hotel, but all opinions are her own and no one from the hotel reviewed or approved the article.